Indications: Antihistamine prescribed for perennial (year-round) allergies, seasonal allergies and skin-related symptoms of allergies, including hives and itching. May be prescribed off-label for other conditions. Summary Recommendations: Xyzal is prescribed to patients with year-round or seasonal allergies. This allergy medication can be prescribed to patients as young as six months old, in the case of year-round allergies. There are no reports of negative side effects in pregnant women or fetuses, thus the pregnancy drug category B. General Precautions: Patients with a known allergy to Zyrtec (cetirizine), drugs containing levocetirizine or cetirizine should not take Xyzal. Xyzal is contraindicated in patients with end-stage kidney disease and/or patients on dialysis. Patients with any stage of kidney disease or liver disease should consult a physician about possible side effects before taking Xyzal. Children absorb twice the amount of Xyzal as adults so proper dosing is imperative for child-safety. Never give a child more than the prescribed dose of Xyzal. If allergy symptoms do not improve or if a fever develops, contact your physician immediately. Symptoms reported in patients taking Xyzal include fatigue, weakness, dry mouth and weight gain. More serious, but less frequently reported, symptoms include hearing problems, nosebleeds, difficulty urinating and agitation. If you feel you are experiencing serious side effects contact your physician. Effects While Trying to Conceive: Animal studies delivered doses 25 times higher than therapeutic doses in humans with no negative effect on male or female fertility. Effects on Pregnancy: Xyzal is in the drug category B, according to the FDA. Doses in excess of 320 times that prescribed to humans showed no negative effects, pregnancy complications or fetal complications. Human studies on the effect of Xyzal during pregnancy have not been completed. As is the case with all prescription and over-the-counter medication, Xyzal should only be used during pregnancy when absolutely necessary. 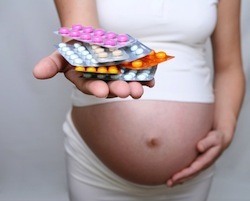 Discuss any concerns about taking the drug during pregnancy with your doctor. Safe During Breastfeeding: There are no reports of negative side effects in infants at small doses of Xyzal. Larger doses may be associated with infant drowsiness or lethargy. There are also reports of reduced milk supply in women taking larger doses of Xyzal. About 10% of mothers interviewed reported infant irritability after breastfeeding. Another 1.6% reported infant lethargy. Antihistamines may reduce serum prolactin levels. This could affect milk production, leaving the breastfeeding mother with diminished milk supplies when taking drugs like Xyzal.